Today Thursday from 7 pm at PAMM, artist Patterson in conversation with LeRonn P. Brooks, PhD and PAMM Chief Curator Tobias Ostrander. 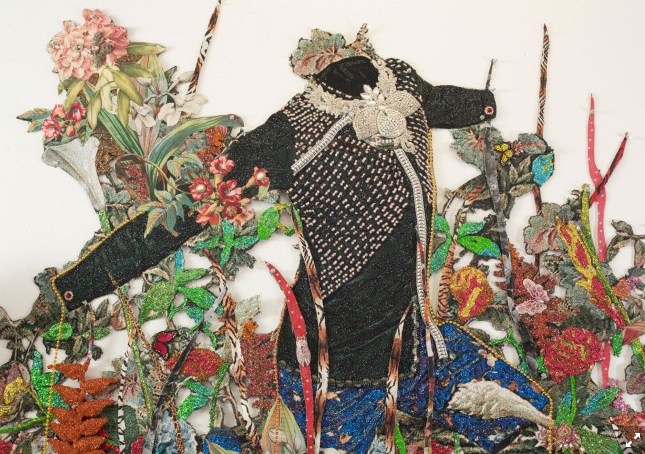 The panel will discuss how Patterson’s work investigates forms of embellishment as they relate to youth culture within disenfranchised communities and break down themes of violence, masculinity, visibility and invisibility within black youth culture globally. Ebony G. Patterson . . . while the dew is still on the roses . . . includes work Patterson has produced over the past five years, embedded within a new installation environment that references a night garden.